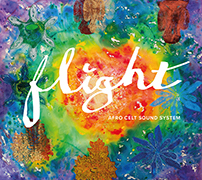 With sales now topping one and a half million albums and two Grammy nominations to date, Afro Celt Sound System released their new album ‘Flight’ in November 2018 to widespread critical acclaim…. “multicultural thought and motion at its finest” Daily Mirror, “captures the exhilaration of their live shows……its spirit and invention are unflagging and uplifting” Observer, “The voices really do take flight” The Sunday Times (Culture). The album explores themes of migration – both human and avian – with a dazzling cast of stellar musicians from around the globe. The band toured the UK in November around the release of the album and will be back in 2019 playing festivals in the UK and abroad.